Have you ever had one of those weeks that makes you just yearn for “normal”? Me, too, and this week has been one of them! My week began with a house strewn with boxes of Christmas decorations, and a lot of misplaced “junk” from the storage room (’cause I have to move heaven and earth to get to the Christmas decorations). Then there was the late-afternoon trip with Ed to meet with a coin dealer. (Did you know that old coins–the ones minted before the 60’s– are becoming quite valuable as the price of silver escalates?) This was most definitely not a normal Monday! Tuesday was spent plowing my way through Christmas decorations, and trying to get the house decorated and “normal” again. I didn’t succeed. I spent the entire day in my kitchen, cleaning and decorating. The good news is–my kitchen looks great. The bad news is the rest of the house is still a mess. One tree out of four is decorated, so far. Wednesday I took out a little time to play “Wednesday Hodgepodge”, then headed out to the city after lunch. Three hours of traveling, plus three hours of sitting in the doctor’s office equals one tired lady by the end of the day. I was the last patient to leave the office that day–and I exited with a handful of orders for lab work and three prescriptions. Thursday, around 1:30 in the morning, our phone rang. The digital x-ray system at the hospital had gone down, and the tech needed advice from Ed. As a result of that call, neither Ed or I got much sleep afterward. By 6:30 we were both up, getting ready to go to the hospital. Ed for work, me for a 3 hour glucose tolerance test to rule out diabetes. What a joyous way to spend the morning! By lunchtime, when the test was finally over, I was “spent”. There’s nothing like drinking a sickeningly sweet drink on an empty stomach, then having blood drawn four times within three hours! I’m up and puttering around today, but I’m exhausted from this week’s activities. The good news is, I passed my glucose tolerance test, the bad news is we still don’t know what’s causing my chronic yeast problem! (Diabetes can sometimes be the culprit) I have one last round of medications to try, along with a reduction in my hormone replacement therapy. If that doesn’t work, I don’t know what’s next…Five months of non-stop yeast has been miserable, and quite frustrating! In three weeks, I have to make the journey back to the city for a re-check at the gynecologist. It will be another long day, and by then it will be only one week before Christmas! Joy, joy! Did you know that in addition to making life miserable, chronic yeast can be hazardous to your health? Oh the things I’m learning as I continue on this road I’m traveling. If you don’t mind, I sure could use some prayers concerning this whole situation. On a happy note, there were a couple of bright spots in this crazy week. On two different evenings this week, we were blessed with visits from Brad, our son who recently moved. He drove over after work to check on things at his old house, and to see us for a bit. It’s the little things that mean the most, and we sure were happy to see his smiling face 🙂 He and his wife, Jennifer, are adjusting to city life, and enjoying their new home. Can you believe this is already the final Wednesday of November? Me either! Today I’m taking a break from decorating for Christmas to participate in the Wednesday Hodgepodge–until I have to leave to go into the city for a doctor’s appointment. In the meantime, I’ll visit as many of you as I can. Only four more Hodgepodges until Christmas. Wow! We’d better get started! 1. With that being said I think I need to dive right in to some Christmas related questions, don’t you? Which do you prefer-pretty gift wrap with a bow or a pretty gift bag with/without a bow? What percentage of your holiday gifts are currently (as in right this very minute) wrapped in some form or fashion? I’m still a bit old-fashioned, and prefer a gift wrapped in pretty gift wrap, and topped off with a nice bow. Old habits are hard to break, but I occasionally use gift bags, too. ( Have I ever mentioned that I once worked as a “gift wrapper” in a small department store? Fun times!) As for how many gifts I currently have wrapped–zero! I actually don’t have a Christmas list, but the thing I wish for is a healthy and prosperous New Year for Ed and myself. Two of my good friends from high school lost husbands to cancer this year. This really puts things into perspective, and makes me realize what’s really important. The people who live inside the residence make it a home. It doesn’t matter if the place is big or small, fancy or plain, a mansion or a camper– or even where it’s located–it’s who’s inside that matters. A home should be a warm and inviting place to keep you safe from the world outside, and it should be shared with loved ones. Both of our homes have always been very special to Ed and me–not because they are large or fancy, but because we literally built them together, with a lot of hard work and love. Both homes have always been filled with lots of love and memories–and they still are. We live in one home, while our daughter and her family live next door in the other one! 4. Motown founder Berry Gordy celebrates his birthday on Hodgepodge Day-November 28th. Are you a fan of the Motown sound? If so, who’s your favorite Motown artist and/or song? Here’s a list in case you’re stuck. I love the Motown sound! My favorite Motown artists are The Temptations and The Supremes, and hearing their songs takes me back in time–to simple, care-free days. “My Girl” is still one of my favorite songs, even after all these years! I don’t care much for green, but red is my favorite color. Guess which color is more prevalent in my closet?! 6. True or false-bacon makes it better? If you answered true, what’s your favorite dish made with bacon? True. My favorite dish made with bacon is an omelet–or, of course, a BLT. As we watched The Macy’s Thanksgiving Day Parade last week, we found it quite interesting that two of the celebrities seen on television were from our “Tiny Town” here in Georgia. First of all there was Brooke Anderson (of CNN and The Insider ), who was one of the hosts and commentators for the parade. Brook graduated from the same small, private Christian school as our children. The other celebrity NFL hall-of-famer, Shannon Sharpe, was raised by his grandmother here in “Tiny Town”, then graduated from our local county high school, and went on to play professional football. It’s a small world, huh? Decades ago, I was blessed to become the mother of three wonderful children, all of whom are now grown and married. Believe it or not, over the years, none of my off-spring ever really moved away–until now. All went to college within driving distance, and continued to live at home, or with Ed’s mom. Our daughter moved “just down the road” to her own home in 1998, while our oldest son married in 2006, and moved seven miles away, to an apartment in town. He was gone for just over a year and a half, and couldn’t wait to move back to the family farm as soon as an opportunity presented itself. Our youngest son, Brad, moved out at age twenty, and went to live with Ed’s mom. He needed room to stretch his wings, and she needed help around the house. Brad lived with her for approximately five years, until her health began to fail. He was a great help to her (and us) throughout those years. 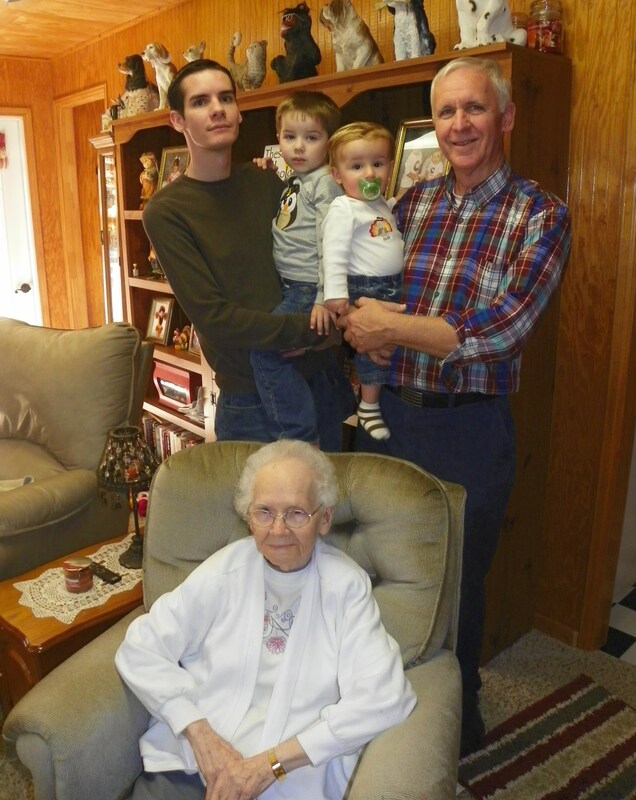 When Mema was no longer able to live at home, she went to live in a personal care home. 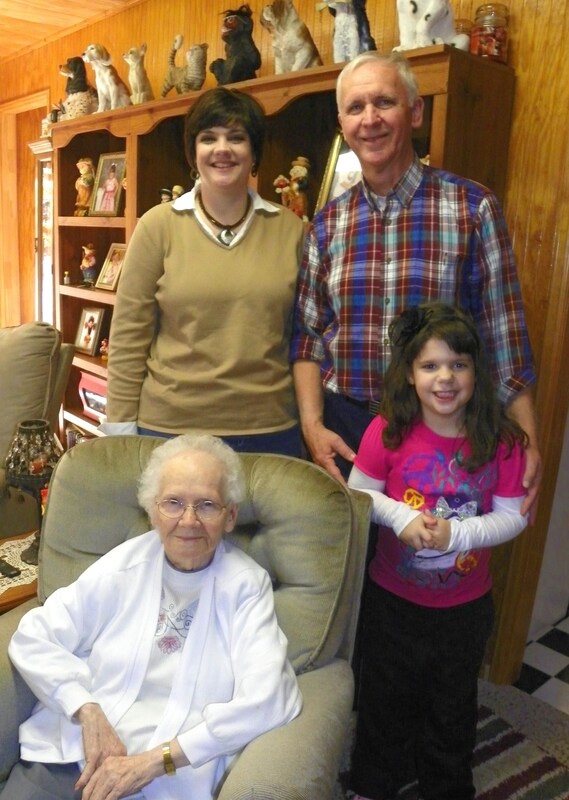 Brad has continued to live in her home for two years, with Mema’s blessings. It was the home where Brad and his new wife, Jennifer, began their marriage in June of 2011. There once was a time when Brad dreamed of having his own home on the family farm, but things happen and dreams change–or to quote Brad, “Life gets in the way.” His new wife, Jennifer, didn’t share Brad’s dream of living on the family farm, and instead had a craving for life in the city where she works as a nurse. 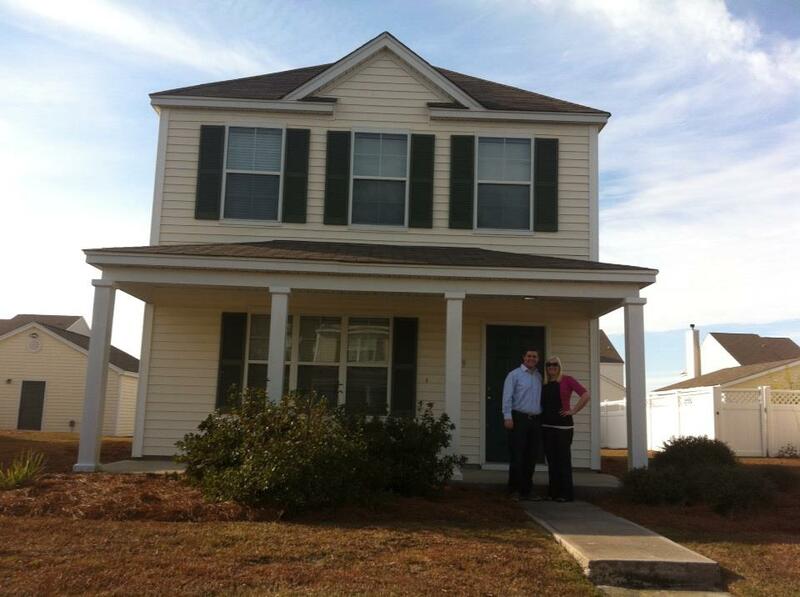 Thus began their quest to pay off debts, then save up for a down payment on a house. Jennifer has been house-hunting almost as long as the couple has been married, and we all knew this day would eventually come. Jennifer’s commute to work will be much shorter now, while Brad’s will be longer, depending on what town he’s working in. They are located only about an hour’s drive away from us, but somehow when I ride by Ed’s mom’s empty house, it seems so much farther to me. You know, it’s funny how life repeats itself. I remember another young wife who once couldn’t wait to get to the city. That was over forty years ago, and the young wife was me! Oh how I loved the opportunities and adventures the city offered, and I enjoyed living and working there, too–for a while. Eventually city adventures and the hustle-bustle grew old, and thoughts of a quiet life on the family farm beckoned us home. It was the best move we ever made! Of course, I wish Brad and Jennifer the best, and I hope both will very happy in their new home in the city. I hope they take advantage of, and will enjoy all of the opportunities that living in the city provides. However, I’d be lying if I didn’t say–I’m secretly hoping, after a few years, they will tire of city living, and find their way back home. Our family survived Thanksgiving, and the three days afterward. I don’t know about the rest of you, but I’m tired of turkey! At the moment, our home looks like a tornado blew in a bunch of holiday decorations, and scattered them all over the house. Seriously, it’s that bad! I’ve been decorating for two whole days, but have barely scratched the surface. I’ll get it taken care of–eventually, but for now, I’m going to stop, take a break, and enjoy Heather and Wayne’s Monday Quiz. 1. 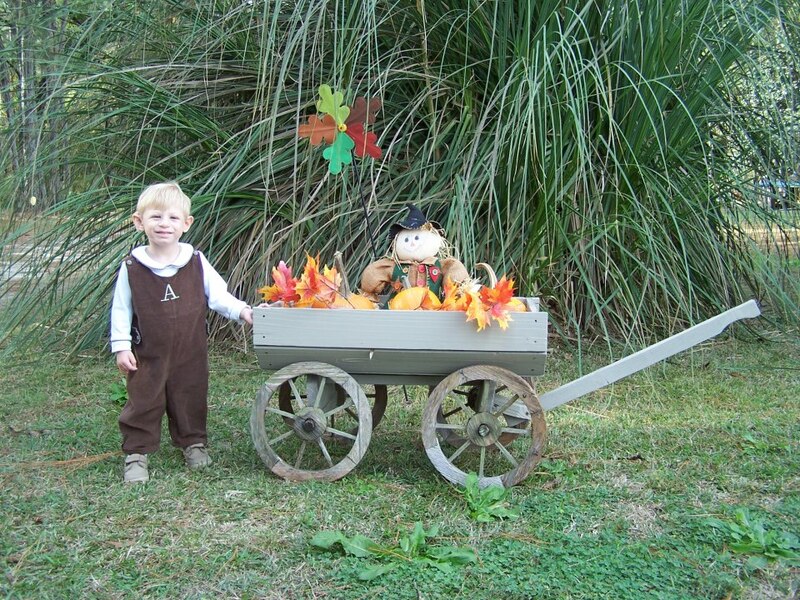 Do you decorate outdoors for the holidays? Those who know me, know that I decorate everywhere for the holidays–including outdoors! We live in a very secluded area, and nobody, except our daughter and her family, sees our outdoor decorations, but I decorate anyway! I put up lights and garland around the front windows and door, and we have some lighted deer, a set of 3 trees, and a lighted polar bear and snowman out in the front yard! 2. What is the best thing about office Christmas parties? The games or entertainment are usually the most fun to me–as long as I’m not the one in the spotlight! I never wear either, but if I did, I’d choose gloves. 4. What do you think of Secret Santas? Playing Secret Santa has been fun when I’ve participated in the past. 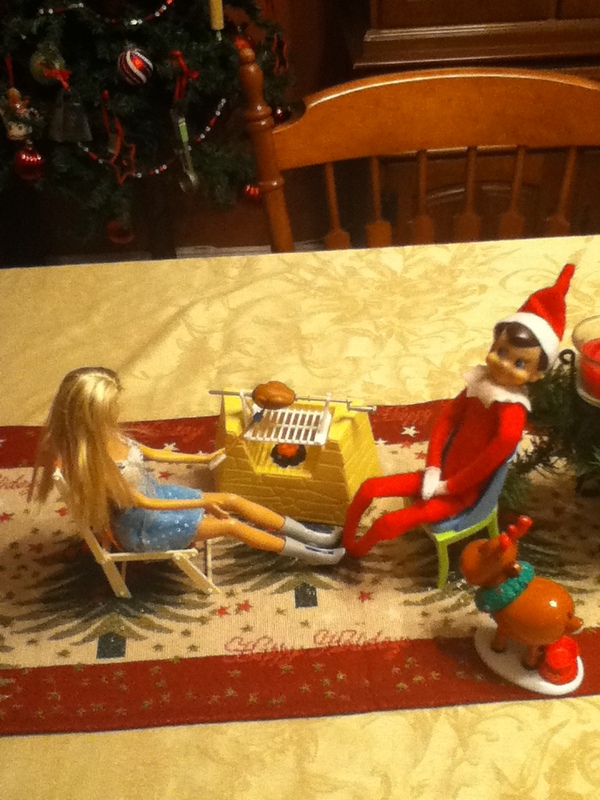 Of course, some Secret Santas are more thoughtful than others, which can sometimes spoil the fun. *I’ll be back tomorrow with details of who moved, and where they went…it deserves a post of its own. Yesterday marked the 41st Thanksgiving that Ed and I have shared together as husband and wife. We had a good meal, and a good day, but it was unusual, and even a bit bitter-sweet for a variety of reasons. First of all, a former co-worker of mine (and fellow church member to our daughter-in-law, Jennifer), unexpectedly lost her 13-year-old daughter on the day before Thanksgiving. The girl had been sick with the flu, then suddenly just collapsed and died at home, without warning. Cause of death is pending, but is assumed to be heart failure. In our little community, where everyone knows everyone, you can just imagine the impact this tragedy made on everyone’s holiday. This year, I bought the largest turkey ever–weighing in at 20 1/2 pounds! I bought such a huge turkey because our family has now grown to a grand total of twelve, including Ed’s mom, and all are normally with us for Thanksgiving lunch, and some are back for supper. After buying the large bird, I later discovered that half of our family had made other plans for Thanksgiving lunch! Oops! After twenty-plus years of baking turkeys, I actually invested in a new roasting pan with a rack, and was excited to try it out. I had Big Bird in the oven by 3:30 am on Thanksgiving morning! Would you believe, I baked that turkey for six and a half hours before the timer popped up? That’s an hour and a half beyond the recommended time! He was golden brown and beautiful–until Ed carved into the thighs…Oops! We quickly discovered Big Bird was still a bit pink around the joints. For the first time ever, a pop-up timer lied to me! First the mishap with the ham a couple of weeks ago, now this! Am I losing my touch??? Our Thanksgiving table was missing five people for lunch this year. Our daughter’s family ate lunch with her hubby’s family, while our youngest son, ate with his wife’s family. Ed and I sat down to eat a quiet meal with his mom, and our oldest son and his family. It quickly became apparent who the loud, talkative members of our family are–and they were all missing! It also became apparent who the big eaters of the family are, too, when I could hardly miss any food after we’d all eaten lunch! By suppertime, we had gotten Ed’s mom safely tucked in back at the personal care home, where she lives, and our oldest son’s family left to go eat with the other side of their family. As they were preparing to leave, some of our missing family members were already arriving to visit and partake in the left-overs for supper. We didn’t get a family group photo this year, but we did take a couple of “Four Generation” photos, which was something we hadn’t done in the past. We also managed to catch the re-run of the Macy’s Thanksgiving Day Parade on our old television. You know, the one with the “issues”… Have I mentioned how happy I am to have it back home? When all was said and done, we had a nice Thanksgiving, after all. Of course, we missed everyone all being together at the same time, but we also realize that times will change, and when they do, we have to adapt and make the best of things. This year also made me so much more thankful for all of the past years when we’ve all been together! Our family has truly been blessed beyond measure, and I am so grateful. On that note, I’ll say–more bitter-sweet family changes are looming just over the horizon, as someone in our family is preparing for a move…I’ll be blogging about that next week. 1. Turkey-love it or leave it? White meat or dark? What’s your favorite thing to make using leftover turkey? I love turkey, probably because I only cook it twice a year. I don’t especially enjoy the preparation or cleanup, but the end result is so worth it! I really only like white meat, but will eat small amounts of dark meat if it’s chipped up and mixed among white meat. (I’m thinking of the school cafeteria, now!) As for my favorite thing to make using leftover turkey–that would be a turkey sandwich! I’ve always hated to run, so I’d rather climb a mountain. I can feel my legs burning at the mere thought of it! It depends. I don’t go out much, so Facebook is a good way to keep in touch with friends and family. I’m more of a reader than a poster though. On the other hand, I hate it when our children/spouses come to visit us, then spend part of the visit with their faces in their phones! I read my Bible, and I pray–and I try very, very hard to understand! Finding that gratitude (for hard times) never comes easily, but it usually comes–eventually. 5. In the US, the day after Thanksgiving has been dubbed ‘Black Friday’. Is most of your holiday shopping done live and in person, or is it done more through the magic of the Internet? How do you feel about stores opening at midnight Thanksgiving night? Will you be out amongst the masses on Friday? These days I do most of my shopping through the magic of the Internet. It beats fighting the rough and ready holiday crowds, and most of the time the shipping is free! Personally, I don’t see why stores can’t just open at a decent hour, rather than midnight or 5 a.m. What difference would a few hours make? As far as I’m concerned, stores being open on Thanksgiving is just wrong. I have two identical pairs of soft, black, knit slacks. They are very comfortable, and I love them. I appreciate the freedom that comes with being in this stage of life. All of our children are grown and happily married, and I no longer have to work. Most of the time, I can do whatever I want, whenever I want to–and that’s a great feeling, especially after many years spent raising a family while holding down a full-time job! Yesterday I posted about our television woes. Ed decided we’d get our old television back. He paid the repairman to bring it home, rather than having to go pick it up himself. After watching the old 36″ regular television for a couple of days, we were so happy to get our 55″ HDTV back–even with its issues!!! The repairman tinkered with its defective panel, and actually reduced the “quiver time” by a few minutes! The picture continues to quiver when the tv is first turned on, but once it warms up, the picture straightens out and plays fine until it’s turned off. We will use our old television until our replacement tv arrives, then we’ll have to decide what we’re going do with it. Decisions, decisions…but I’m thankful to still have the right to make them! Happy Thanksgiving, everyone! Oh No, Say It Isn’t So! You may (or may not) recall that my laptop computer died about three weeks ago. Actually, I still recall it all too well! I remember the pain in my head becoming more intense by the minute, while I shopped for a laptop on-line! I had no idea what specifications to look for, and the item descriptions might as well have been written in Latin! I kept coming back to a small, inexpensive, laptop among the weekly featured items on Best Buy’s website. I wasn’t familiar with the name brand (Lenovo) so I asked our oldest son about it. He told me it’s the brand used on the university campus where he works as a computer support specialist. I figured if it was good enough for GSU, it’s good enough for me! Our youngest son is also somewhat of a computer whiz, so I called him on Friday morning to get his opinion on the computer, before Ed and I made the 60 mile trip to Best Buy that afternoon. As luck would have it, Brad was off from work, and actually offered to go along with us to Best Buy! We bought the computer, Brad helped me get it set up, and gave me a few pointers on how to use Windows 8. Some of the features of Windows 8 sort of boggle my weary mind, but so far, I’ve been able to do what I need to do. With the computer issue settled, you’d think all would be well in our household, as far as electronics are concerned, right? Wrong! The 55 inch flat screen television that we purchased two years ago, recently decided to start “having issues”. Say it isn’t so! You may (or may not) recall what an ordeal we went through in purchasing this television. The shopping experience was so stressful, it earned its own post HERE! Folks, it looks like we may be in for another “television ordeal”! Fortunately, I had the good sense to purchase an extended warranty for the television when we bought it, and fortunately, it’s still in effect! On Wednesday morning, the repairman informed me that the problem with our television is going to be so expensive to fix (a bad panel), that the warranty company will most-likely do a “buy out”. I’m not exactly sure what this means, or how it works, but I guess I’ll find out soon! In the meantime, the repairman has our television, and Ed and I are watching our old 36″ television from eight years ago (that we borrowed back from Brad!) We started out trying to watch the 32″ tv from our bedroom, but I couldn’t see it, and Ed couldn’t hear it! What a couple of old farts we’ve turned into! Update! The warranty company called me yesterday afternoon. They are shipping us a new television, and it should be here within 7-10 days. It’s comparable (in size and features) to our old television, but isn’t the same brand, which they said wasn’t currently available. To the average person, this wouldn’t matter, but I’m extremely “picky” about televisions, so I’m cautiously optimistic. I sure hope this ends well! One thing’s for sure, I’ll definitely be purchasing an extended warranty for the new television! For Ed, my husband of 40 years, our three grown children and their spouses, and of course, the grandchildren! For Ed continuing to have a job (during tough economic times), for the amount of debt we’ve been able to reduce this year, for two successful gardening endeavors, and of course, for “my girls” (the chickens). 2. What was your special dish that your parents made for you while growing up? No special dish, that I can recall, but I loved their vegetable soup, mama’s cole slaw and egg custard pie, and daddy’s bar-b-qued chicken. It’s funny the little things you miss after your parents are gone. 3. How long are you willing to wait for someone before you give up? It would depend on who I was waiting for, and why. I waited for (my now husband) Ed for nearly 3 years, while he was away serving in the army. I don’t regret a minute of it! 4. What is your favorite quote, poem, song lyric or prayer? 5. So, what will you be doing on the day after Thanksgiving? It’s been quite a while since I’ve mentioned little Alex, and in case you’ve forgotten him, Alex is the toddler that my daughter babysits. Alex was born very premature, weighing in at about a pound and a half. As you can imagine, extreme measures had to be taken to ensure Alex’s survival, and unfortunately, some of those treatments resulted in a severe loss of hearing for him. When Alex first came to stay with my daughter, he was already almost a year old. However, Alex was quite small, and was still wearing newborn-sized clothing. Alex had severe eating issues and wasn’t thriving. He wore hearing aids in both ears, but it was apparent that he couldn’t hear much, if anything. To say it’s been an interesting year for my daughter and Alex would be an understatement! My daughter and Alex bonded quickly. She became the firm, but patient and loving, force that Alex desperately needed in his life. 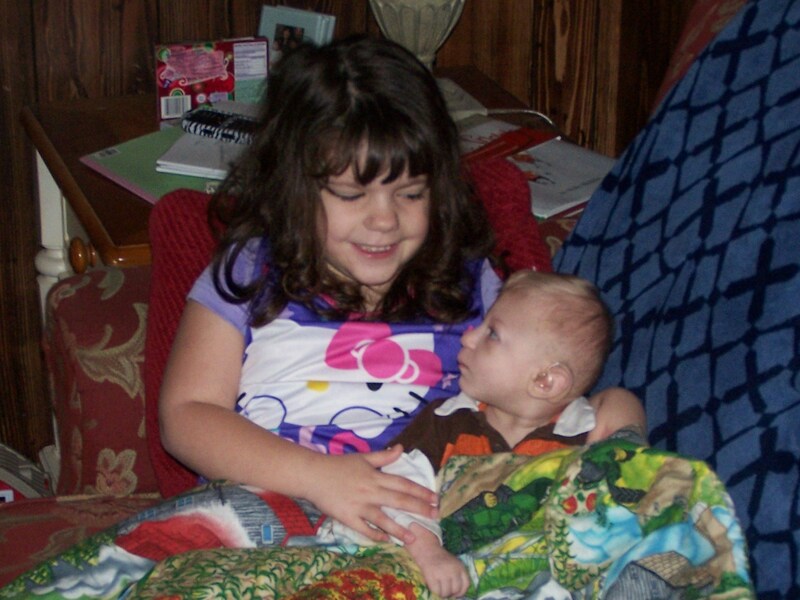 Her five-year-old daughter, Madison, and Alex quickly became inseparable, too. Both are only children, and seem to find comfort and joy in each other’s company. Alex steadily continued to grow and develop throughout the year. First, by learning to crawl– and soon he was crawling at a break-neck speed! Next he walked with a medical walker for a time. Then Alex learned how to climb the toddler slide, and I happened to witness and film the event. Not long after learning to climb the slide, Alex began to take steps on his own, by walking back and forth between my daughter and granddaughter. By the summer’s end, Alex was not only walking–he was running–and climbing the bigger slide! Alex’s eating issues continue to this day, but they are better than they were ten months ago. My daughter has learned all sorts of tricks to get Alex to successfully eat the pureed foods that his mother sends each day–such as sitting Alex in the kitchen sink while she feeds him! Water distracts him, plus the sink makes cleanup a lot easier, in the event the food comes hurling back up! Alex has been growing at a slow, but steady pace. 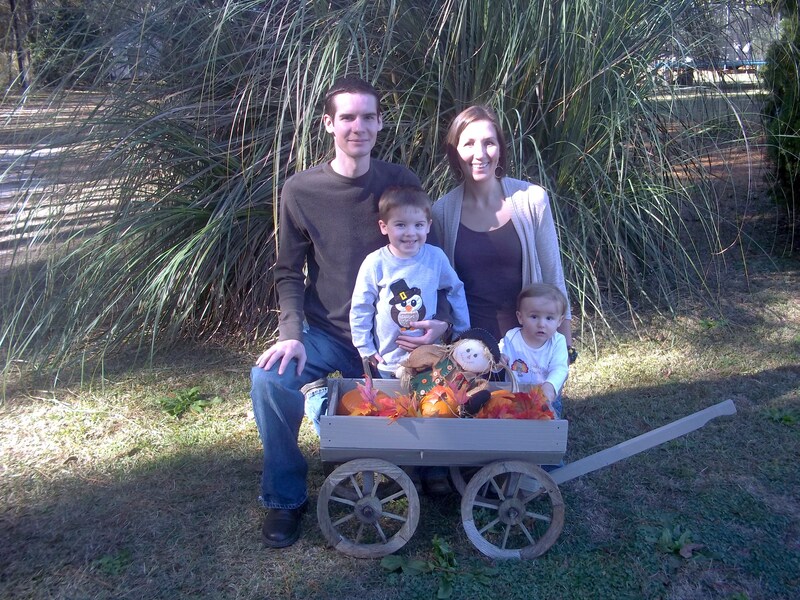 Earlier this year, Alex’s parents pursued the option of cochlear implants for Alex’s hearing issues. After having a battery of tests done on Alex, then having him turned down as a candidate for implants, the parents sought a second opinion from a doctor in a neighboring state. Fortunately, the second doctor agreed to perform the surgery. About three weeks ago, little Alex had a cochlear implant put in the first ear. Alex required several days of healing time before the implant could actually be turned on to see if the surgery was successful. Finally, the day came when Alex’s implant could be turned on to see if it would work–and it did! After twenty-one months of silence, little Alex heard his first sounds last Thursday! What a glorious day for Alex and his family–and for my daughter, too. She cried when she heard Alex’s good news, and was elated to hear Alex babbling his first sounds while talking with his mom on the telephone. The volume on Alex’s implant is turned very low, so he can gently get used to sounds. Each week the volume will be adjusted slightly until it gets within the normal range of hearing. It’s truly a joy to see how much being able to hear has changed Alex! Before the surgery, Alex seemed to be in his own little world, but now that he can hear, Alex is gradually becoming immersed in the world around him. There’s also a little sparkle in Alex’s eyes that wasn’t there before–and it’s a great thing to witness! In a few weeks, Alex will have surgery on his remaining ear, and the same process will begin all over again. It will require some patience and work to teach Alex how to talk, but the end results will be well worth the efforts! Thank goodness for medical miracles– and for loving, patient baby sitters, too! After a brief hiatus, due to hurricane Sandy, the Hodgepodge is back! Kudos to Joyce for taking the time, and making the effort to host this great meme, even though we all know life in her “neck of the woods” is far from normal. You know the drill, copy and answer the questions, then link up over at Joyce’s place. Visit as many participants as you can, and have a good time! 1. What rule of life should never be broken? Never intentionally hurt your loved ones. 2. What’s your favorite family recipe? My Aunt Ruth’s pecan pie recipe. It’s the best I’ve ever tasted. 3. Is the media manipulative? Yes, very much so! Case in point–last week’s presidential election, and its outcome. Can I just take a moment and rant about our news media and the events currently flooding the airways?! It’s amazing how many secrets are being disclosed– now that the election is over! Perfect timing, I’d say. 4. Hubs and I saw Skyfall last weekend…are you a fan of the Bond films? If so, who’s your favorite Bond? I’ve never been a huge fan of Bond films, but I do like Pierce Brosnan. 5. What is one thing you hope people never say about you? That I wasn’t a good wife or mother. 6. What’s a nearby tourist attraction you’d like to see, but haven’t gotten around to visiting? I’d like to take a guided tour of historical (downtown) Savannah, Ga.
7. Where’s your favorite tree? It’s located in my living room, and it’s called “the year-round tree”. It’s technically an artificial Christmas tree which I decorate (with everything from hearts to turkeys) each month to correlate with events or holidays. My favorite “real tree” is located in our oldest son’s yard. It’s a sycamore tree that we brought home from my brother’s yard in Florida. That tree was just a twig when we brought it home, but it’s now grown into a very large, beautiful tree! Recently, I ran into a situation that I’ve never encountered during my 40+ years of cooking. A while back, I purchased a ham and put it in the freezer. I thawed it out to bake for Ed’s birthday dinner on Sunday. When I unwrapped the ham, I wasn’t particularly thrilled with the way it smelled, but convinced myself it was just a “strong-smelling” piece of meat. I prepared the ham for cooking, then put it on to bake. As the ham began to bake, it began to smell even stronger! I let the ham finish cooking, but sent Ed to pick up some fried chicken for his birthday dinner. I’m not sure what the problem was with that ham, but I certainly wasn’t going to serve it to Ed or our guests! All was not lost though, our two dogs will be enjoying baked ham for supper every night this week! So far, I haven’t heard any complaints from them.